Discover Pittsburgh today through 163 stunning photographs showcasing its sports venues, museums, businesses, universities, and cultural landmarks, all of which prompted The Economist magazine to name Pittsburgh “the most livable city in the United States.” Once regarded as part of the industrial rust belt whose glory belonged to another century, Pittsburgh today is renowned for its economic emphasis on education, research, health care, professional services, and advanced technology industries. The area is also a thriving cultural mecca. See popular landmarks, such as Heinz Hall Plaza, Allegheny County Courthouse, and Carnegie Mellon University, and visit Point State Park, Fort Pitt Museum, the original Primanti Bros. restaurant, and much more. 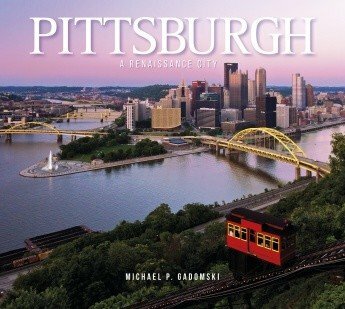 Complete with detailed captions, this book celebrates Pittsburgh’s heritage, beauty, and diversity and is a must-have for tourists, history buffs, architects, and anyone who wants to see why it is a city for the twenty-first century. AUTHOR. Michael P. Gadomski is a third generation Pennsylvania native. In addition to working as a Pennsylvania State Park ranger and naturalist for more than 25 years, he has been a freelance writer and photographer for nearly 40 years. His written articles have appeared in several publications. His photography has been published worldwide in books, calendars, greeting cards, advertisements, interpretive displays, and magazines including Natural History, Sierra, Country, and Backpacker. He is also the photographer of five previously published coffee-table books, Wild Pennsylvania: A Celebration of Our State’s Natural Beauty, Philadelphia: Portrait of a City, The Catskills – A Photographic Portrait, Reserves of Strength: Pennsylvania’s Natural Landscape, and most recently The Poconos: A Stream Between Mountains.